Reagan's own economic advisor David Stockman admitted that Reagan's 'trickle down' economics - which continues to be the Republican economic scam - was a fraud of smoke and mirrors. Reagan was a cocaine trafficker. As documented by History Channel America's War on Drugs series, by Gary Webb's Dark Alliance and others, Reagan was responsible for 1,000s of kilos of cocaine coming into the USA each month during the 1980s. This was a massive hypocrisy as Reagan and wife Nancy Reagan did TV ads and lectures using their slogan, "Just Say No" to drugs while at the same time Reagan was directly responsible for the flood of cocaine coming into the USA. Over 2,000 lbs. a month were coming into Los Angeles alone. The African-American population of Los Angeles, San Francisco, and others cities saw dramatic spikes in violent deaths, gang activity, health crisis, and incarceration as thousands of pounds of cocaine was being dumped into their communities. Reagan's CIA director Casey made an agreement with the Justice Department that no CIA operative dealing in cocaine or other drug trafficking would be arrested. As Reagan's Ollie North would later admit - 'Reagan knew'. Reagan gave military support to Saddam Hussein of Iraq. Not only military equipment but also, as stated in The New York Times of August 18, 2002 by former US military personal, Reagan allowed US military to direct logistics and targeting for the Iraqis during the Iran-Iraq War. Even though Reagan knew that the Iraqis were using chemical warfare in their attacks. It is illegal for the US to assist the use of or directly use chemical weapons. Reagan allowed Iraq to import bacterial cultures that assist biological weapons. In 1982, tanks were covertly shipped to Saddam, as well as helicopters, and "bacteria/fungi/protozoa" cultures that could be used to make biological weapons. This is reported in Newsweek magazine, Sept. 2002. In 1979-1980, Nicaraguan civilians overthrew the US supported dictatorship of the Samosa family in Nicaragua. In Iran, Iranian citizens overthrew the US supported dictatorship of the Shah of Iran and took American embassy personnel hostage. The Iranians rifled through the American embassy looking for documents identifying CIA operatives and the names of the Shah's American trained terrorist police force the SAVAK. Barbra Honneger, a former Reagan aide, says that the Reagan campaign for president interfered with the attempts of then President Jimmy Carter to get the American hostages taken by the Iranian revolutionaries released. Ms. Honneger, Gary Sick (at the time a aide to President Carter), and Iranian businessman Mansur Farhang say that meetings took place where Iranian officials met with Reagan campaign officials Mr. Allen and former CIA chief and Vice President candidate George Bush senior. Mr. Allen and Bush passed millions of dollars in payment to the Iranians to delay the release of the hostages until after the US Presidential election. An early release of the hostages, an "October surprise", as it was called would probably defeat Reagan. Mr. Allen and George Bush also promised that the US under Reagan would send military equipment to Iran which they needed in their war with Iraq. So Arms shipments to Iran, forbidden by US laws began as early as 1981. The American hostages were released within minutes of Reagan's inauguration as President. Reagan created, against Constitutional Laws of the USA, a secret military government that ran it's own foreign policy contrary to laws of the elected U.S. government. This secret government sold weapons to Iran and dealt with illegal drug traffickers (such as Manuel Noriega of Panama) for airplane landing access to unload illegal shipments of weapons destined to former members of the death squads of deposed Nicaraguan dictator Samosa. Cocaine drug trafficking was allowed into the USA to give added revenue to the former death squad members, now called the Contra forces and as payment for the pilots making the deliveries. "The Contra connected drug pipeline clearly pumped tons of cocaine into the United States during the early -to -mid 1980s...U.S. law enforcement agencies were aware of links between a U.S. religious organization and two Nicaraguan counter-revolutionary groups which involve an exchange in the United States of narcotics for arm." (The name of the religious group remains classified). George Morales was under indictment for drug smuggling when members of the Reagan secret government approached him to organize a smuggling operation of weapon shipments to Costa Rica. Morales says that his contacts were Reagan staff member, Elliot Abrams and then Vice President George Bush. Gary Betzner was one of Morales pilots. Betzner says he flew shipments of illegal arms to the Costa Rican Ranch of CIA operative John Hull. They unloaded the arms and loaded on to the plane 500 kilograms of cocaine which Betzner then flew back to the USA. 40 kilos of which would be his payment for each flight. Reagan's organization operated their own finances from secret accounts in Swiss banks and lied to Congress about the existence of the operation. The money and guns allowed the mercenary "army" to kill thousands of Nicaraguans and destabilize the organization of government. The Nicaraguans had just overthrown the repressive rule of the US supported dictator Samosa. What was the plan if the US public found out about the operation? Oliver North was a major member of the secret operation. He and members of his group planned to suspend the US Constitution, establish martial law and round up "anti-government" dissidents when the Reagan government unleashed its planned direct military strike into Latin America code named "Night Train." When the existence of the secret government was uncovered, which could lead to Reagan and Bush being impeached from office, Reagan's Attorney General, Ed Meese, informed a key organizer of the operation, Oliver North, that North had 3 days before the government would come to take North's records of the operation. North and secretary Fawn Hall spent the 3 days shredding documents to hide the extent of the covert actions. Before Congress and under oath to tell the truth, North lied about the drug running operations, didn't answer about the suspension of the Constitution, and would say that Reagan was not informed of the operation. Then after Reagan had left office, North would say "Reagan knew" about the treason of the secret government. Fawn Hall would undergo cocaine addiction treatment and say later that "Oliver North used me like tissue paper". Arms and drug runners, Morales, Betzner and Manuel Noriega were silenced by arresting them for drug smuggling. Noriega was head of the government of Panama when President Bush senior conducted an illegal US military invasion of Panama and abducted Noriega to the USA, where he resided in Federal Prison. Noriega said he was paid millions by the USA for the smuggling operation, the CIA admitted to $300,000. The Reagan Republican party took millions of dollars from foreign governments and private corporations to defeat anti-business political candidates. Senator Clark of Iowa, was defeated with the aid of money from the racist Apartheid government of S. Africa. Senator Clark had engineered and passed the Clark Amendment in Congress that kept the CIA out of the war in Angola Africa. The Apartheid government wanted CIA money and equipment to interfere in the civil war going on there. When an international boycott of the brutal Apartheid government was organized, Reagan said the US would not take part as it would "hurt the economy of the US." The USA, with the aid of Israel, was sending military equipment to the Apartheid government. In 1981, Reagan restarted military shipments to the despotic military junta in Guatemala. The previous President, Jimmy Carter, had stopped shipments to protest the juntas murderous civil war it had unleashed on the Guatemalan people. In a Truth Commission report released in February 1999, " The USA gave money and training to a Guatemalan military that committed acts of genocide against the country's Mayan people." Not since Nixon's impeachment presidency had so many top level government officials had to resign or were convicted of various criminal charges as during the Reagan term - over 100 people. resigned under investigation that he had sold US mineral mining rights to contributors to Reagan election campaign for pennies on the dollar of value. was convicted as assistant in Reagan's Housing Urban Development department, of selling Federally mandated low income housing to Reagan contributors. The housing was supposed to be for the poor, but the buyers not only got the properties cheap, they turned the properties over and sold them for big profit to rich land developers. Batista was the dictator, the American Mafia and the American government were the support system. Batista led a military coup in 1933 and ruled behind the scenes as a series of puppet leaders gave the facade of government. American Mafia gangster Meyer Lansky was a friend of Batista and brought Mafia expertise to running the gambling houses of Havana. "Latin Las Vegas", Havana became saturated with Mafia gambling and illegal drug running operations. A Mafia summit was held in Havana to coincide with the singing debut of Frank Sinatra. In attendance were Mafia bosses, Frank Costello, Vito Genovese, Santo Trafficante jr., Moe Dalitz and others. 20,000 people in opposition to Batista from governmental personnel to student protesters, and labor leaders were murdered. Student leader Antonio Guiteras in 1935, Jose Echeverria, in March 1957, and Frank Pais are just a few of the dissident voices to the dictatorship of Batista that were murdered. Batista took over the government himself in March 10, 1952. USA President Eisenhower formally recognized the Batista government on March 27, 1952. Shortly thereafter, Batista suspended the Constitution as well as the right of workers to go on strike. Batista skimmed governmental monies meant for education, public health and Cuba's infrastructure as well as getting a percentage of the profits from the Mafia gambling houses. By 1955, student riots and anti-Batista demonstrations were growing in frequency. Fidel Castro led a revolution that drove Batista and the Mafia out of Cuba in 1959. Castro took over US oil refineries angering the US government of Eisenhower. Eisenhower gave CIA approval to develop and train a Cuban force that would make an amphibious landing on Cuba and overthrow Castro. In 1960, John Kennedy became US President and inherited the Cuban invasion plan. At the Bay of Pigs in Cuba, the invasion began with US ships carrying and unloading the anti-Castro forces into landing craft , Kennedy, seeing correctly that the small disorganized force would be defeated, withdrew the use of US military air support and the invaders were easily crushed by the Castro forces. For conspiracy thinkers to the assassination of Kennedy in 1963, the Bay of Pigs incident is a prominent part of the puzzle. Kennedy by not supporting the Bay of Pigs, angered not only the anti-Castro Cubans now living in the USA but also the Mafia, who by not getting back Cuba, cut off millions of dollars in gambling, and drug profits. It is said that Jack Ruby, the killer of suspected Kennedy assassin Lee Harvey Oswald, was a Mafia figure and owed the Mafia thousands of dollars in gambling debts some of which were incurred in Havana. American hypocrisy - preaching freedom and human rights at home while abroad America was supporting murderous dictatorships that crushed human rights and freedoms. Reap what you sow. Another brutal dictatorship supported by America. This dictator's family ruled Nicaragua for 30 years. Various USA Presidents supported this and other dictators throughout Latin and South American in the 20th Century. In return the USA got great deals on access to natural resources and cheap labor costs. 1 to 10% of the population would control all the land. The vast majority of the population were poor peasants, who were suppressed by the violent police and military under the control of dictators like Samosa. America supplied and trained these police terrorists. US President Carter changed US foreign policy, when he ordered that military supplies would not be given to countries with brutal Human Rights records. Nicaragua and Guatemala were among the first countries dropped from military shipments. In 1979, Samosa was overthrown by a peoples revolution. In 1980, Ron Reagan became US President. He revoked the policy of Carter and resumed shipments to the brutal USA created military junta of Guatemala. In Nicaragua, against the laws of the US Congress, Reagan set up an illegal military supply line to former members of Samosas death squads who were trying to reinstate the dictatorship of the wealthy. Reagan allowed the 'Contras' - the name of the Samosa forces - to ship cocaine into the USA. 1,000s of kilos a month were smuggled into the USA. From various accounts, 2,000 lbs. of cocaine a month were being brought into Los Angeles.The sale of the cocaine was supposed to be funding the Contras but most of the profits went to criminals. The Great Hypocrite Reagan and wife Nancy Reagan deflected the cocaine issue by starting a propaganda campaign of 'Just Say No to Drugs'. All the while Reagan was the biggest cocaine trafficker. In 1954, US President Eisenhower ordered the overthrow of the elected government of Jacobo Arbenz by the CIA. A US corporation, the United Fruit Company ( later renamed Chiquita) had requested the action. Arbenz had begun a policy to try and get more access of the peasantry to education, health care and land. Large land owners used the peasants as near slave labor in the operation of their plantations. Arbenz sought to redistribute some of the land to the peasants. As is common throughout Latin and South America, the land was owned by a very small wealthy elite. Arbenz sought to bring equity to the situation. The United Fruit Company complained such action would impede their profits and Eisenhower ordered Arbenz overthrown. The military took over. Violently they set about driving peasants off their land, destroying their farm operations so as to drive them back to work for the wealthy landowners. A small resistance group arose against the USA imposed military junta. Thousands were killed during the civil war. The USA supplied the military forces and trained the military forces in torture. The Human Rights abuses by the junta were so brutal and flagrant that eventually the US under President Carter, suspended military equipment shipments. US President Reagan restarted the shipments in 1981 and the brutal murders resumed. Bishop Juan Gerardi was murdered on April 23, 1998. He had just released an independent study showing that the Guatemalan military was responsible for over 80% of the death and "disappearances" during the civil war from 1954 to the cease fire in 1997. Captain Byron Lima Oliva and his father Colonel Byron Lima Estrada are implicated in the murder of Bishop Juan Gerardi. Another report released in February 1999 by the Historical Clarification Commission blames the military for more than 90% of the estimated 200,000 people killed in the civil war. It states that the "United States gave money and military training to a Guatemalan military that committed "acts of genocide" against the country's Mayan people." A further statement in the report, " Believing that the ends justified everything, the military and the state security forces blindly pursued the anti-communist struggle, without respect for any legal principles or the most elemental ethical and religious values, and in this way completely lost any semblance of human morals..."
In the strange trajectory of history, Jews were brutally terrorized by Christians for over a 1,000 years before the Nazis. Then in the post World War 2 era, Jews migrated to Palestine and overthrew and continue to repress and terrorize the Islamic Palestinian people. Here is the root of the solution to the erroneously named, "War on Terror." Again, and again Islamic sources, whether Al Qeda, Arab news organizations, or Islamic citizens of the mid east area will tell you that the continued USA support of Israel's repression of the Islamic Palestinian people is the cause for the Al Qeda attacks against America. The history is direct and supported by Israeli government documents released in the 1980s. The Jews, of the area called Palestine, drove the Arab, Islamic civilian population off the Arabs' land during the war of 1948. After the war, the new Israeli government refused to allow Palestinians to return to their land. The Palestinian people were the majority population of the area by as much as 85% of the total population. They had been the majority population and the major land owners of the land, then called Palestine, for over 1,000 years. This Israeli land theft is the root cause for the years of Palestinian resistance to the Israeli government and is the root for Islamic groups attacking America. America has been the force in the United Nations (UN) that has repeatedly vetoed UN resolutions seeking to force Israel to satisfy the Palestinian claims for land restitution, address apartheid style repression of the Palestinians, and the murder of Palestinian political leaders. America is the main financial support for the existence of Israel. One third of all US foreign aid budget goes to Israel, a country the size of New Jersey. This equates to $ 3 Billion taxpayer dollars a year. This much influence from a US Jewish population, according to US census, of only 5 million? How does Israel control American Congress? The American Israel Public Affairs Committee ( AIPAC), exerts a huge influence on American politicians. AIPAC gathers political influence money from over 100 Jewish political action committees and doles out millions to American Legislators who vote the - Israeli - way that AIPAC wants. This group continues to operate against the American laws of campaign funding. The US Federal Election Commission ( FEC ) laws require such a political organization to register with the FEC and open their books listing their money and where the money came from. AIPAC does neither. Israel has more nuclear weapons than China or France. these weapons of Mass Destruction were supported and created by materials supplied by the USA. Against international law, Israel has fired US ammunition containing depleted uranium against Islamic Palestinians. Ariel Sharon as Defense Minister of Israel allowed the Lebanese Christian Militia, the Falangists, to enter two of the Palestinian refugee camps, Sabra and Shatila. The Falangists slaughtered Palestinian women and children there. Israeli say 800 murdered. The Palestinians say that 8,000 were murdered. 1983, Sharon had to resign when a commission of inquiry assigned him, "indirect responsibility" for the Sabra and Shatila massacre. Early in 2002, a military leader of the Falangist militia was killed by a car bomb as he was going to testify at a war crimes inquiry against Ariel Sharon for the murders at the two camps. They funneled illegal arms shipments to Iran in 1985 -1986, during US President Reagan's secret illegal 'Iran-Contra' war with Nicaragua. With the backing of such a world power, Israel has arrogantly refused peace negotiations to settle the just claims of the Palestinian people. Numerous United Nations resolutions have been passed with broad international support that condemn Israel's actions against the Palestinians only to have the resolution vetoed by the USA. In April 1948, at Deir Yassin, Israeli commandoes named, the Irgun, raped and murdered 250 Arab women, children. Menachim Begin, later a leader of Israel, was the leader of the commandoes. Ironically, when one exits from the Holocaust Museum in Israel, one is looking across to the place where Israelis slaughtered Palestinian women and children. Yitzhak Shamir, another head of government, was wanted as a terrorist for the murder of a United Nations Peace soldier in 1948. Here is an example of the convoluted effects of intolerance based upon a religion. With the philosophy of Zionism, an 1800s idea of religious destiny as their basis, the Jews fled antisemitism of Europe and the murderous disaster inflicted upon them by the Nazis and came to the country of Palestine. As early as 1915, European Jews were organizing to force the creation of a Jewish state safe from the vicious antisemitism that had existed throughout Russia and Europe for centuries. In 1917, the British released the Balfour Declaration that stated the British interest in establishing a Jewish State in the area that was Palestine. The British released the Declaration to stir up unrest in Palestine. Palestine was then controlled by Turkey. Turkey and Britain were enemies at the moment during World War 1. Britain had also, through its famous spy, Lawrence of Arabia, made promises to the Arabs of creating an Arab state as well. Arab concerns, even though having 85% of the population, were dropped in the Palestine area, but Britain did create an Arab country - Iraq. In the 1930's as the Jewish immigration to Palestine began to increase, Palestine was a country , with a population that was more than 85% Islamic, and 95% of the land owned by the Islamic Arabs. In a strange twist of history, the Jewish immigrants in action and philosophy, mimicked the repressive measures done to them by the Nazis in the Jewish "purification" of the land of its Arab population. Joseph Weitz, administrator in charge of Zionist colonization is quoted from his diary, " Between ourselves it must be clear that there is no room for both people together in this country...we shall not achieve our goal of being an independent people with the Arabs in this small country.... And there is no other way than to transfer the Arabs from here to the neighboring countries, to transfer them all, not one village, not one tribe should be left." This was written in the 1930's when the Jewish population was under 20% and only 5% of the land was owned by Jews. In 1948, the Jews forcibly took over the region and named it Israel. They moved the Islamic Palestinians off land, forced them into "refugee camps", kept them out of government decisions about the area, and limited their freedoms. Out of such repression, a force of resistance emerged led by a young man from the refugee camps- Yassur Arafat. Arafat was made head of the Palestinian Liberation Organization, (PLO) in 1968. Israel was not and is questionable if it is today a self sufficient country. Israel survived through the years only due to massive foreign aid monies and military supplies from the USA. Without such continued welfare, Israel would have collapsed and even today if that money was withdrawn, Israel might still collapse. Al Qeda's violence against the US on September 11, 2001 attacked the money source that continues the brutal suppression of the Islamic Palestinian people and their just claim that the Jewish population stole their land. This repression of the Palestinians supported by the USA is the enlistment campaign material that gets Islamic people to join anti-American efforts. The key to end the "War on Terror" for the USA? Cut all taxpayer funding of Israel. The Israeli Likud Party, the party of Ariel Sharon, on May 13, 2002 stated that it is forever opposed to the creation of a Palestinian State. America suffers with these small groups of people demented with bitterness, violence, and hate. They fill their lives with bile and anger. They have been indicted numerous times for murders throughout the USA. 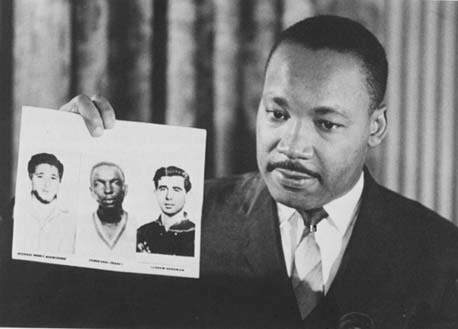 Dr. Martin Luther King jr. holds a photo of three men, Michael Schwerner, Andrew Goodman, and James Chaney killed by the Klu Klux Klan, an extremist hate group, in Philadelphia Mississippi in 1964. The three men had been working on voter registration in the southern states of the USA. Initially, the State of Mississippi, so politically infiltrated by the Klan, refused to bring indictments against the murders. Members of the police force - Sheriff Rainey and Deputy Price - were found to have actively participated in the murders. Thousands of American citizens were murdered, beaten by hate filled people who wanted to maintain racial discrimination. The Klan and other similar hate groups continue to use violence against people exercising their human rights. US Senator Strom Thurmond, Alabama Governor George Wallace, and all elected officials in the southern American states actively supported segregation throughout the 1950's and 1960's. Strom Thurmond even ran as a candidate for President of the United States on a promise to maintain racial segregation. Governor George Wallace stood on the steps of an Alabama school to bar the way of African American children from attending the public school. "Segregation today, segregation tomorrow, segregation forever", was Wallace's comment of racial tyranny.